Have you have ever been one to get stuck in a queue on an airport, and stuck your neck out to its maximum to see one traveller holding up the whole queue? He has the luggage opened up like a patient midway through surgery, his clothes are all over the security check counter (often showing much more than the eye should see), arms filled with the shoes and extra layers of clothing he had wound himself in, to shield himself from the incessant cold on the air plane. Now what if that very traveller was you? You are the reason for the whole queue to be delayed. The bee line behind you is cursing you, and the day you booked your air ticket. A traveller’s nightmare, isn’t it? We give you travel hacks so that you can be the fastest to escape from the tough security checks at airports across the world! Bulky or long Jackets come under the category of loose clothing with a lot of room. And hence, they are most often asked to be separately scanned through in airport security. During Monsoons and Winter specially, these jackets do come in handy, but while going through airport security, try your best to completely avoid them. Safest Travel Hack: Use a shawl or scarf if your objective of wearing a jacket was to keep warm during the super cold airplane journey. During monsoons, try using a lighter or more transparent rain coat that will require lesser time to scan and is easier to carry than a comparatively bulkier trench coat. This hack is for travel in general, if not only for air travel. Special attention must be given to the shoes that you choose to wear while you travel. For high-heel lovers: many high heels have nails in them that can set off the body scanners and hence may stand to be cause of a major delay in security check for you, and for the unfortunate others behind you. 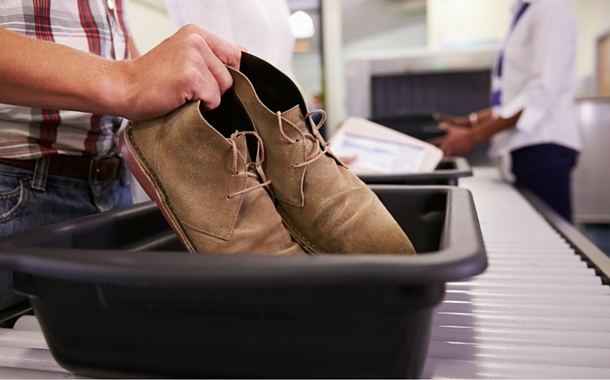 Safest Travel Hack: Always wear shoes that are light and easier to slip off, preferably ones without laces. Also, the base of your shoes must not be thick. Moccasins, Loafers, Sneakers are the safest closed footwear options. In the section of hair styling, The less you do the better. Bobby pins, U Pins have a tendency to set off body scanners, and it really wouldn’t hurt to avoid metal hair accessories altogether! Safest Travel Hack: If your hair is long, tie your hair up in a bun. If the tiny front hair prove to be a pain, a good tight hair headband should ideally do the trick! Jewellery is something that is close to the heart of Indians specifically, but when it comes to travel- it’s best that you keep your heart where it belongs- inside! Gold, Silver and other precious metals don’t come in the way of the scanners for sure, but it may pose a bit of a security concern for you. Moreover metal accessories in particular may set the scanners singing. Safest Travel Hack: Avoid Jewellery. Period.